As you are shopping for new lighting for your home, you may want to take a look at the fantastic benefits of LED lighting. LED lighting is the latest innovation for indoor and outdoor lighting design. Unlike conventional lighting, which relies on traditional bulbs, LED lighting is equipped with innovative LED light bulbs. LED light bulbs are extremely energy efficient , and will last for many years before they need to be replaced. In addition, your LED lights will provide soft and warm lighting for your home. A company offering modern lighting in San Jose can provide you with more information about LED lighting. To hear more about the benefits of LED lighting, check out this video. The kitchen is the heart and soul of your home. Whether you are creating a kitchen for a new construction project, or are updating your existing kitchen with stylish new features, you will have many factors to consider. One of the most important elements of any kitchen design is the kitchen lighting. By working with a company offering kitchen light fixtures near San Jose , you will be able to choose the perfect kitchen lights for your home. 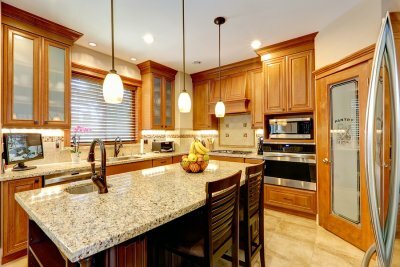 From recessed lights to pendant lights and more, there are a variety of different types of lights that are used in today’s kitchens. Read on for a closer look at some factors to consider when you are choosing kitchen lighting. When you are choosing new kitchen lights , it is important to consider the function of each type of light that will be used in your kitchen. For example, different layers of light can be used to provide task lighting, ambient lighting, and more. Additionally, you may want to add visual appeal to certain areas of your kitchen by placing decorative lights. Not only can kitchen lighting be used as a functional part of your kitchen design, but your kitchen lights will also set the mood for your mealtimes and gatherings. To create your kitchen lighting design, it is a great idea to consider what type of mood you would like in your final kitchen. For instance, translucent fixtures can be used to provide your kitchen with a soft and happy mood. Efficiency is a final factor to consider when you are choosing new kitchen lights. When you are working with a lighting contractor to create a new design for your home, you may want to consider choosing bulbs and fixtures that are as energy efficient as possible. With energy efficient kitchen lights, you can help to cut back on your energy consumption on a daily basis. If your landscape is an integral part of the appeal of your home, why limit your enjoyment to the sunny hours of the day? The right type of lighting in San Jose can allow you, your family, and your guests to enjoy the view at any time of day or night. 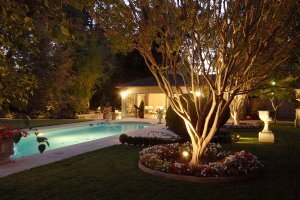 Landscape lighting can even bring new life to your plants and shrubs as well as your patios and walkways, in addition to the practical benefits it provides. Keep reading for a closer look at the benefits of landscape lighting. Perhaps the most apparent benefit of landscape lighting is the impact it can have on the aesthetic appeal of your home and property. Your family, your guests, and the entire neighborhood can continue to enjoy the beauty of your yard and the exterior of your home long after the sun goes down thanks to your landscape lighting. In many cases, this can make your landscape stand out even more after dark than it does during the daytime. You can flood your landscape lighting throughout your entire yard, or you can illuminate certain aspects of your design for a more customized aesthetic display. Depending on what the exterior of your home is like, it may be challenging for you to make it to your own front door without tripping over tree roots or children’s toys. Fortunately your landscape lighting can keep you safe from injury by lighting up a path. This tends to be especially helpful for friends, family, and other guests who might not know what to expect as they approach your door. Additionally, outdoor landscape lighting can allow your pickup family soccer games to run into the later hours rather than being cut short by the darkness. One important benefit of landscape lighting that many homeowners might forget is its ability to deter criminals. If someone were to invade your home, he or she would likely try to avoid being seen; it is much more difficult to sneak into your home if your landscape lighting system takes away any potential hiding spots. Homeowners who are looking for new designs would do well to play around with lighting in San Jose; different types of lighting can produce vastly different scenes, allowing them to cheaply and effectively alter their designs. Regardless of why you would like to bring new light to your home, it is important that you do so with the help of a quality lighting company. Wright Lighting and Fireside is happy to help you with any kind of lighting project so that you can enjoy your dream lighting design. Continue on to learn more about why you should work with Wright Lighting and Fireside. You can use lighting for many different reasons. You might want to illuminate your backyard for your own viewing pleasure, or you might want to use lighting as security system that protects your home and family from potential invaders. You should work with Wright Lighting and Fireside because we care about your end goal. We strive to understand your needs and help you achieve them to the best of our abilities. Our team of personable professionals puts customer service first, and we have been fortunate enough to form countless new relationships thanks to our customer service values.